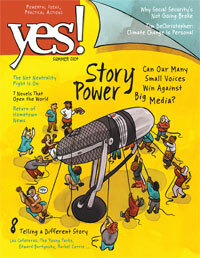 This article appears in the Summer 2014 edition of Yes! magazine and is (cc) by Yes! Republished under a Creative Commons license. Some rights reserved. On a cold night in January, eight people gathered in a harshly lit classroom at Northern Essex Community College in Haverhill, Mass. Over cookies and bottled water, they discussed their latest plans for a project that has been years in the making—a cooperatively owned online news operation to cover their working-class city of 60,000. The site, set to launch by the end of 2014, will be known as Haverhill Matters. It is the fruition of an idea called the Banyan Project, developed by Tom Stites, a retired journalist whose career included stops at The New York Times and the Chicago Tribune. As with food co-ops, the site will be owned by the members, who will be able to join by contributing money or labor—perhaps by writing a neighborhood blog or covering governmental meetings. If it is successful, Stites hopes to roll out similar news co-ops around the country. The goal is to serve “news deserts,” a term Stites adopted from “food deserts.” Although Haverhill is covered by a daily and a weekly newspaper, they do not compete: Both are owned by an out-of-state corporate chain that has cut its staff significantly in recent years. The papers no longer have an office in Haverhill. Stites believes that just as a lack of fresh, nutritious food can be harmful to personal health, so, too, can a lack of fresh, relevant news be harmful to civic health. How would Haverhill Matters make a difference? Mike LaBonte, who co-chairs the planning committee, cites the voluminous coverage given to the 1971 opening of a farmers market by the independent daily that then covered the city. Forty years later, he says, an attempt to revitalize the market received minimal attention. 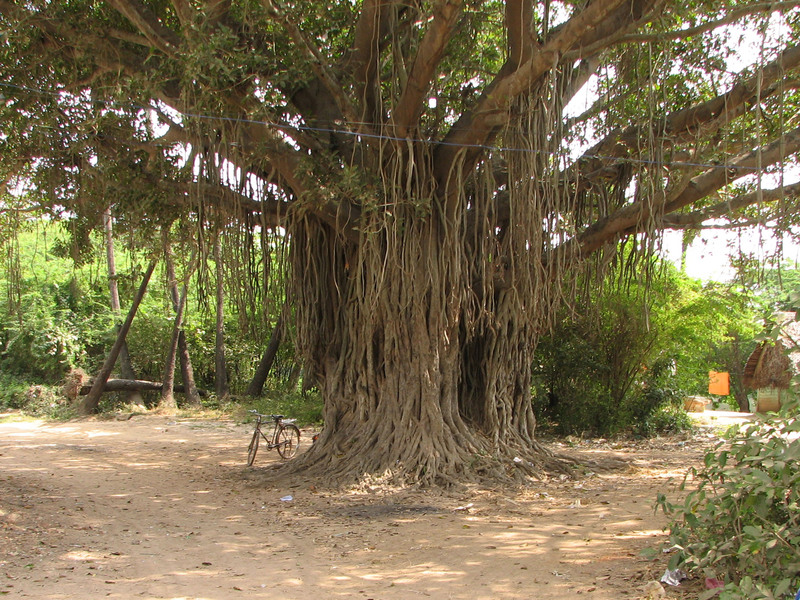 The Banyan Project may prove to be one way of revitalizing civic engagement through local journalism, but it is far from the only way. Across the country, as traditional news organizations have shrunk, independent online news organizations have sprung up, sparking renewed interest in community not just through news coverage, but also by creating a conversation around that coverage. One of the oldest of these online news communities is the New Haven Independent, founded in 2005 by Paul Bass, former star reporter and political columnist for the alternative New Haven Advocate (killed off by its corporate owners). The Independent is staffed by four full-time journalists and is supported through foundation grants, donations from wealthy individuals, sponsorships by large institutions such as colleges and hospitals, and reader contributions. From the beginning, Bass has carved out a niche that is distinct from the local daily newspaper by fostering an ongoing conversation with his community. Examples range from the ambitious, such as citywide forums on education reform and local politics, to the accidental, such as a mayoral candidacy that played out in the Independent’s comments section in 2007. In that instance, a local real-estate agent announced he was running, only to face a barrage from other commenters after he expressed ignorance of the city’s African American neighborhoods. To his credit, he withdrew shortly thereafter, writing that he realized he had much to learn about his adopted city. Bass takes comments seriously. Pseudonyms are allowed so as to protect police officers, teachers, parents, and other city stakeholders who would be uncomfortable speaking out under their real names. But every comment is screened by someone on the Independent’s staff before it is posted—or rejected. Bass had to tighten up the rules following an outburst of online sociopathy sparked by an unusually contentious mayoral campaign in 2011. Among other things, would-be commenters now have to register using their real names, though Bass still allows them to post under their pseudonyms. Overall, though, the comments are far more civil and substantive than is the case at most news sites. Civic engagement at the Independent can also take the form of day-in, day-out news coverage of relatively small quality-of-life issues that larger media can’t be bothered with. For instance, in 2010 the Independent reported on two incidents in which city police confiscated cell phones from bystanders so they couldn’t take video of officers as they made arrests. The Independent flogged the issue for months. The result: statements from the mayor and the police chief affirming the right of the public to take video of police actions; an internal investigation that found officers had mishandled the two incidents; a mandatory training session at the police academy; and a bill filed at the Connecticut Statehouse making it easier for camera-wielding civilians to sue in response to police harassment. Though the bill did not pass, overall it was an impressive display of how a small news organization rooted in the community could punch above its weight. “I’ve learned that the public can steer the conversation and take the story to a better place than reporters or editors could ever take it alone,” says Bass. Four hundred miles west of New Haven, in the small city of Batavia in western New York, Howard Owens is promoting a different kind of civic engagement. 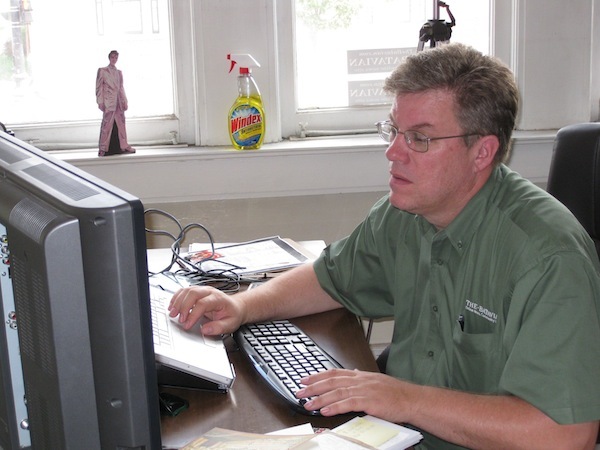 Since 2008, his community news site, The Batavian, has been covering Batavia and rural Genesee County—first as part of the GateHouse Media chain, and then independently after Owens’ executive position with the company was eliminated in early 2009. Like Bass, Owens takes online comments seriously; unlike Bass, he requires commenters to use their real names. Owens has done his share of in-depth coverage at The Batavian, competing with—and sometimes beating—the local daily paper. What keeps his readers engaged, though, is his close attention to more mundane matters: fire alarms, accidents, new park benches being installed, and the like. Owens is especially passionate about The Batavian’s relationship with local businesses. As a for-profit, the site depends on advertising, and one of Owens’ beliefs is that “advertising is content.” The Batavian is filled with small ads—nearly 150 of them—from pizza shops, funeral homes, doctor offices, heating companies, tattoo parlors, car dealerships, dog groomers, and the like. Owens does it for the money, of course. But he also is a strong believer in the importance of locally owned enterprises in building a self-sufficient community. As a matter of principle, he refuses to accept ads from Walmart and other national chains. The New Haven Independent and The Batavian are proving that both nonprofit and for-profit models can viably foster independent hyperlocal news sites. Both of them, though, depend on professional journalists. In Haverhill, Tom Stites and local activists are hoping to find out whether volunteers can produce worthwhile journalism if they’re provided with a sense of ownership and put to work alongside professionals. The Banyan model calls for two full-time paid employees, an editor and a general manager. The rest of the coverage will come from volunteers, including neighborhood residents and students. It’s a tall order, given how labor-intensive local journalism can be. Before it can happen, though, the Haverhill Matters planning committee needs to find out if residents will support the project. Committee members figure they need $50,000 in donations from so-called founding members, as well as continuing support in the form of $36 annual fees from at least 1,200 members. At a time when most news sites are free, it’s an ambitious undertaking. The Haverhill Matters launch has been postponed on several occasions. At the January planning meeting, Tom Stites said 2014 has to be the year that it finally gets off the ground. For those who believe in the importance of local journalism and civic engagement, the experiment unfolding in Haverhill will be important to watch. 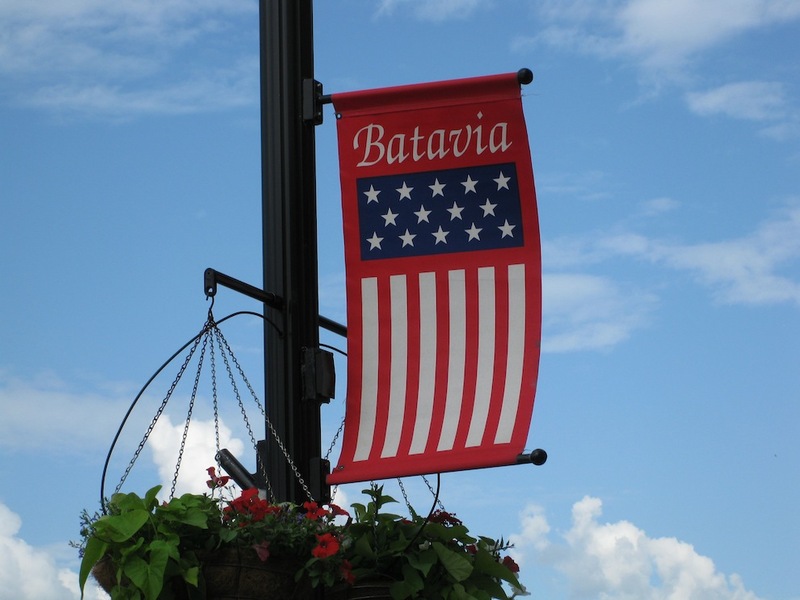 Here is a blog post I wrote in July about The Batavian’s growth. This article was previously published by the Nieman Journalism Lab. The New Haven Independent, which launched eight years ago amid the first wave of online-only community news sites, may soon expand into radio. The nonprofit Independent is one of three groups asking the FCC for a low-power FM (LPFM) license in New Haven, Conn. If successful, editor and founder Paul Bass says that “New Haven Independent Radio” could make its debut at 103.5 FM in about a year. “It would be a fun thing if we get it. I’m told it’s very hard,” Bass says. “We’re by no means talking as if we’re going to get this license. We thought it would be worth a shot.” He envisions a mix of news from the Independent and La Voz Hispana de Connecticut, the Independent’s content partner (and landlord), as well as music, public affairs, and shows produced by local nonprofit organizations. The station would be on the air at least 16 hours a day. According to the Prometheus Radio Project, a longtime advocate of expanded community radio, “the over 800 low-power stations currently on the air are run by nonprofits, colleges, churches and emergency responders.” For years, the radio industry and (believe it or not) NPR fought the expansion of LPFM, arguing that new stations would interfere with established broadcast frequencies — a concern that advocates say is unwarranted. 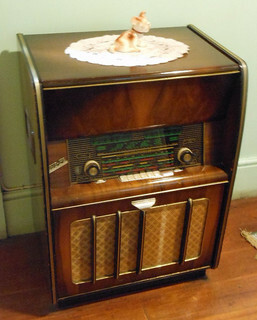 Like all LPFM stations, New Haven Independent Radio’s broadcast footprint wouldn’t extend much beyond the city limits, although it would stream online as well — which could be significant, Bass says, given predictions that most cars will have streaming Internet radio within a few years. Bass says he got the idea from WHAV Radio in Haverhill, Mass., a nonprofit online community station (it also has a weak AM signal) whose volunteer general manager, Tim Coco, is seeking to expand with an LPFM license of his own. (I wrote about Coco’s radio ambitions last summer.) Coco, who runs an advertising agency and is a local politico of some note, is also among a group of residents working to launch a cooperatively owned community news site to be called Haverhill Matters, under the auspices of the Banyan Project. Although Bass, if he is successful, may be the first hyperlocal news-site operator to start an independent radio station, the connection between the two media is a natural one. For instance, Howard Owens, publisher of The Batavian, a for-profit site that covers Genesee County in western New York, has partnered since 2009 with WBTA, an AM station with a strong community presence. An even more ambitious project is under way in the heart of the country, as the St. Louis Beacon news site is merging with St. Louis Public Radio. Donna Halper, a longtime radio consultant and historian who is an associate professor of communication at Lesley University, says a multiplatform presence of the sort Bass envisions is crucial at a time when the audience has become fragmented. On the other hand, industry observer Scott Fybush, who writes about radio for his own eponymous website, warns that Bass may not quite realize what he is getting into. One of the New Haven Independent’s funders has already put up $3,000, which paid for legal and engineering services. If Bass wins the license, he estimates it would cost $30,000 to build the station and $60,000 to $70,000 to pay a full-time employee to run it — a substantial amount over the approximately $500,000 a year the Independent now receives in donations, foundation grants, and corporate sponsorships. The opportunity is clear enough. Done right, it would enable Bass to bring New Haven Independent journalism, with its hyperlocal emphasis on neighborhoods, schools, and city politics, to a new audience — and to entice that audience, in turn, into sampling the Independent. Photo (cc) by Michael Coughlan and published under a Creative Commons license. Some rights reserved. I had a great time meeting people in Batavia, N.Y., this past weekend to promote “The Wired City.” My thanks to bookstore owner Erica Caldwell of Present Tense Books for putting it together. I enjoyed catching up with Howard Owens, the publisher of The Batavian, with whom I’m in regular touch but who I hadn’t actually seen since 2009. I also had a chance to meet Tom Rivers, a former reporter and columnist for The Daily News of Batavia who — inspired by Owens — started a local news site called the Orleans Hub earlier this year. 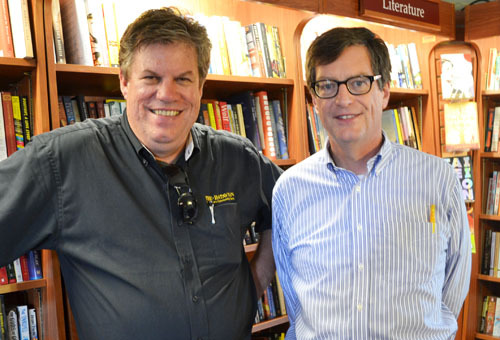 Tom, who’s written two books about life in Genesee County, also interviewed Owens and me for his site. This article appeared earlier at the Nieman Journalism Lab. I’ll be reading from “The Wired City” this Saturday, July 13, at 11 a.m. at Present Tense Books, located in Batavia at 101 Washington Ave.
For those of a certain age, perusing the ads posted at The Batavian, a for-profit news site in Batavia, N.Y., can seem a lot like flipping through the pages of a weekly community newspaper a generation or two ago. Which is to say there are a lot of ads — more than 140, every one on the home page, a practice that publisher Howard Owens believes is more effective than rotating them in and out. There are ads for funeral homes and pizza shops. For accountants and tattoo parlors. For auto-repair centers and ice-cream stands. For bars and baseball (the minor-league Batavia Muckdogs). The success of The Batavian matters to the future of local journalism. In my book “The Wired City: Reimagining Journalism and Civic Life in the Post-Newspaper Age,” I devote most of my attention to the New Haven Independent, a nonprofit site that subsists on grant money, donations and sponsorships. At this early stage of online news, nonprofits like the Independent are often able to raise more money more quickly than for-profits. But not every community can support a nonprofit. Thus it is vital for the future of news that entrepreneurs like Owens figure out the for-profit side — which is why I also devote a fair amount of space in “The Wired City” to what’s going on in Batavia. Owens launched The Batavian in 2008 as a demonstration project for GateHouse Media, where he was the director of digital publishing. When his position was eliminated in early 2009, he asked GateHouse if he could take the fledgling site with him. He was granted his wish. The Batavian is free and covers not just the city of Batavia (population 15,000) but surrounding Genesee County (60,000) as well. It receives about 80,000 unique visitors per month, according to Quantcast. That’s roughly the same as the site’s newspaper competition, The Daily News, also based in Batavia. (Web analytics are imprecise, and Owens says his internal count, provided by Google Analytics, shows about 118,000 uniques per month.) Of course, The Daily, as the locals call it, depends mainly on print distribution. On the other hand, The Batavian covers just one county to The Daily’s three, making Owens’ online reach all the more impressive. If a nonprofit like the New Haven Independent can raise more money than a for-profit (indeed, Independent founder and editor Paul Bass chose the nonprofit route in 2005 because he realized he couldn’t support himself with a for-profit), there are nevertheless certain advantages to for-profit online journalism. Let me outline three of the more obvious. • Anyone can start a for-profit news site. The nonprofit route requires approval from the IRS and support from local foundations. In many cases, neither may be forthcoming — and as I recently wrote, the IRS has all but halted approval of 501(c)(3) status for nonprofit news sites, which they depend on so that donors can make tax-free contributions. By contrast, all it takes to launch a for-profit site is talent, experience and a willingness to work hard. That’s no guarantee of success, but the opportunity is there for all. • Local ads enhance the vibrancy of a site. Owens likes to say that advertising is content. The ads at The Batavian give you a good feel for Genesee County — and provide a context for Owens’ coverage of everything from court news to traffic accidents, from school events to development proposals. Advertising and news work together to provide a well-rounded picture of the community. Yet you won’t see ads at a nonprofit site like the Independent, save for a few image-building “sponsorships” from local institutions such as college and hospitals. • For-profit sites enjoy the full protection of the First Amendment. Like public radio and television stations, but unlike the vast majority of newspapers, nonprofit news sites are legally prohibited from endorsing candidates for public office. “Editorial endorsements — or the denial of them — are among the most powerful tools that newspapers have for holding political figures to account,” write the media scholar Robert McChesney and the journalist John Nichols in their 2010 book “The Death and Life of American Journalism: The Media Revolution that Will Begin the World Again.” The Batavian hasn’t actually endorsed any candidates, but at least it’s not legally prohibited from doing so — and Owens takes strong stands on other local issues without having to worry about the federal government swooping in and threatening his livelihood. Photos (cc) 2009 by Dan Kennedy. I had an interesting experience Friday debating politics with Jeff Jacoby and Howard Owens on Twitter. It was the usual: big versus small government, federal versus local, food stamps and the best way to help the poor, etc. I thought we had a civil discussion, although it got a bit heated at times. Then others came in and were pretty disparaging of Jeff and Howard. And I realized what a difference it makes when you know someone in the real world, and how that changes the way you frame your online discussions. I know Jeff and Howard offline, and I also know they are as intelligent and well-read as I am, if not more so. Yes, I think they’re wrong on some issues, but I know they arrived at their positions honestly and that I’m not going to change their minds by shooting off 140-character rockets. And it underscored the futility of getting into social-media battles with people you don’t know. It is a massive waste of time. Yes, talking politics with people we know is always a good idea. Listen and learn. Even if you don’t change your mind, you’ll understand more than you did before. And don’t bother fighting with strangers. Speaking of online conversations … like many, I have found that discussions are often richer and more substantive on Facebook than anywhere else. So feel free to weigh in here. 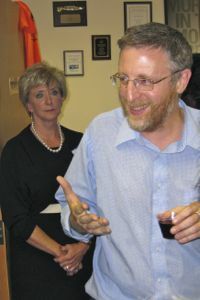 Paul Bass speaking at the New Haven Independent’s fifth-anniversary party, Sept. 15, 2010. Yes, that’s two-time U.S. Senate candidate Linda McMahon in the background. This article appeared previously at the Nieman Journalism Lab. The star attraction was supposed to be Diane Ravitch, a prominent critic of education reform. But the real stars were the audience members themselves. I had driven to New Haven on this day in late November 2010 to see if Paul Bass, the founder and editor of the New Haven Independent, could pull off an audacious experiment in civic engagement. The Independent, a nonprofit online-only news organization, is the principal subject of my new book, “The Wired City.” The subtitle — “Reimagining Journalism and Civic Life in the Post-Newspaper Age” — reflects my belief that news can’t survive without public participation. What we got that night was full immersion. Stage right, Ravitch sat with 11 other people — principals, teachers, school officials, a high school student, a board of education member and the like. Stage left, a half-dozen media folks and elected officials, including Mayor John DeStefano, were live-blogging the event. The forum was webcast on television and radio, as well as on the websites of the Independent and the New Haven Register, the city’s daily newspaper. Viewers at home — and, for that matter, those in the auditorium who had laptops — were able to engage in a real-time, online conversation with the live-bloggers. Afterwards, readers posted a total of 53 comments to the two stories the Independent published (here and here). The archived video was posted as well. Finally, in a touch that seemed almost old-fashioned, the 200 or so people who attended were invited to line up at two microphones during an extended question-and-answer period. Among the myriad crises facing journalism, perhaps none is more vexing than civic illiteracy. Starting in the 1990s, leading thinkers such as New York University’s Jay Rosen began sketching out ways for news organizations to listen to their audience’s concerns and to shape their coverage accordingly. This “public journalism” movement, as it became known, fizzled as newsroom budget cuts and criticism from traditional journalists took their toll. But if the audience doesn’t care about the public-interest aspects of journalism, then there really isn’t much hope for a revival. Over the years, newspaper publishers have responded to the decline of civic life by loading up on celebrity gossip and so-called news you can use, such as personal finance and cooking tips. It’s a losing game, because there are always going to be better sources of such information than the local newspaper. Trouble is, Putnam’s machers and schmoozers were aging even then. And so it is up to news organizations not merely to serve the public, but to nurture and educate the public so that it is engaged with civic life, and thus with the fundamental purpose of journalism. C.W. Anderson, in his book “Rebuilding the News: Metropolitan Journalism in the Digital Age,” writes that “journalists [report] the news in order to call a particular form of public into being.” Along similar lines, I argue in “The Wired City” that creating a public is at least as important as reporting on its behalf. No longer can it be taken for granted that there is a public ready to engage with news about last night’s city council meeting, a speech by the mayor or plans by a developer to tear down a neighborhood landmark and replace it with yet another convenience store. In researching “The Wired City,” I learned that the readership for the New Haven Independent comprises a wide swath — elected officials, city employees (especially police officers and teachers), leaders and activists in the African-American community, dedicated localists and members of what struck me as a surprisingly large and politically aware group of bicycling advocates. Though the Independent’s audience is not as large as that of the New Haven Register, its concentration inside the city limits and its popularity among opinion leaders — “the grassroots and grasstops circles,” as Michael Morand, an associate vice president at Yale, described it to me in an interview — gives the site outsize influence. Indeed, it was the Independent’s relentless coverage of a controversy over the video-recording of police actions by members of the public that led to a clarification from the police chief that such recording was legal. It also led to mandatory training for all officers. The “wired city” that I argue the New Haven Independent brought into being is a community built around local news, empowered by the “lighter and cheaper tools” that have become available during the past decade and a half. Through events like the Diane Ravitch forum, through carefully (if not perfectly) curated user comments and through the now-taken-for-granted convenience of always being just a few clicks away, the Independent has succeeded not so much as an entity unto itself but as the hub of a civic ecosystem. As Clay Shirky has observed, with local newspapers slowly fading away, no single alternative will replace what they once provided. We need a variety of experiments — for-profit, nonprofit, cooperative ownership and voluntary efforts. The challenge all of them face is that serving the public is no longer enough. Rather, the public they serve must first be assembled — and given a voice. Photo (cc) by Dan Kennedy and published here under a Creative Commons license. Some rights reserved.